Social media has a major impact on how we communicate, interact, and understand the world. It is now intricately linked with global, national, and local politics. We take this for granted. But we are now coming to understand that social media is used in particular ways in societies experiencing ongoing violent conflict or emerging from a period of war. For those of us who analyze complex conflicts and their resolution, understanding how social media promotes conflict—and peace—is critical, and becoming more so with each passing day. In conflict zones, social-media platforms have been used by militaries and militias on all sides of disputes to recruit fighters and to both clarify and exacerbate political and ethnic divisions. Opponents use information found on social media to locate and attack adversaries. Such uses tend to intensify conflict. But social media also provides valuable information that can help noncombatants. Many platforms track the activity of violent groups and militaries. These can help civilians to stay out of harm’s way or direct them to locations where they can access humanitarian aid. 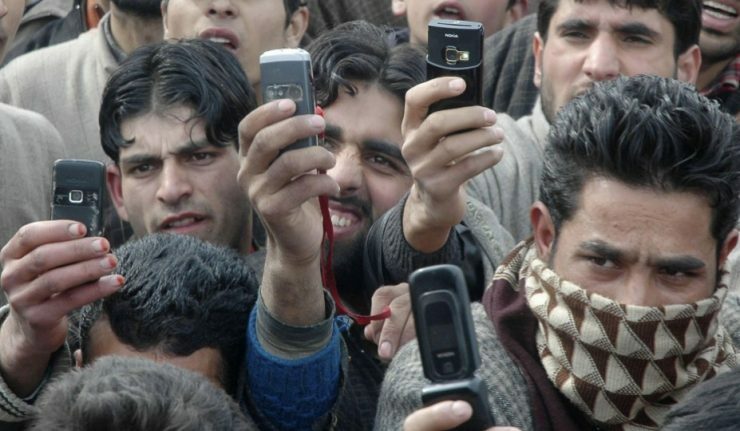 Videos of interactions between Kashmiri locals and Indian security forces are shared quickly through such platforms as WhatsApp and Facebook. In April 2017, footage of a soldier standing on the neck of a student who was being beaten with a metal stick by another soldier spread widely, igniting protests at regional college campuses that lasted for weeks. In this case, social media was used to monitor the actions of security forces and hold these security forces accountable for their actions. In their fascinating new book LikeWar: The Weaponization of Social Media, Peter W. Singer and Emerson Brooking reveal the extent to which social media has transformed violent conflict. For example, the Israeli Defence Forces use Twitter to pace their airstrikes. Islamic State apparently copied Taylor Swift’s approach to social media to recruit new members. Newspapers, radio, and television have all been used—and continue to be used—to incite violence, spread misinformation, and promote campaigns for the “hearts and minds” of local populations. In only one example from fairly recent history, the infamous radio station Radio Télévision des Mille Collines in Rwanda broadcast propaganda against Tutsis, moderate Hutus, Belgians, and the UN peacekeeping mission in July 1994, creating an atmosphere that almost certainly contributed to the genocide that followed. However, researchers and political analysts who study social media agree that virtually instantaneous transmission and the ability of anyone with a cellphone to share information is making more information available and changing how such information is used. More and more, militaries are building social media into their strategies and tactics. The Canadian armed forces are considering new ways to respond to disinformation campaigns, recruiting staff with social-media skills, and engaging with the Canadian public on social-media platforms. The belief is growing around the world that militaries need to respond more rapidly to what happens online. But speedy virtual responses can have long-lasting and possibly devastating consequences in the real world. Social-media platforms were created and are controlled by private firms that continue to shape how information is categorized and which information is seen by users. Critics are concerned that these firms are not accepting responsibility for how their technology is used in conflict zones. In Myanmar, Facebook was used to spread rumours and hate speech against the Rohingya population. Legislators from Rakhine province, where most Rohingyas lived, called for violent attacks against them. In August 2017, 6,500 Rohingyas were killed and many more displaced in what the United Nations described as a systematic attack on the civilian population. The UN called for senior military leaders to be tried for war crimes. But the UN also criticized Facebook for enabling hate speech and calls to violence by being slow to respond to repeated concerns. A report commissioned by Facebook and released in November 2018 showed that the company should, indeed, have done more to stop its platform from being used to spread hate. But Facebook also blamed the population in Myanmar for not reporting problematic content. Civil-society organizations believe that a big source of the problem lies in the fact that Facebook and other tech companies don’t have moderators who understand the language and culture of all the countries in which their platforms are used. It is becoming increasingly clear that national governments will force the owners of the main social-media platforms to do more to discourage hate speech and the inciting of violence. Legislators will take steps to ensure that these companies are doing their due diligence. Understanding all the impacts of social-media use in conflicted societies is relevant for peace researchers. This can only be done in context. Researchers need to understand how new technologies are shaping particular circumstances AND how they are being shaped by the dynamics of each conflict. The impact of social media will vary with each conflict. What is beyond dispute is that researchers must pay attention to all forms of electronic messaging. With everyone from lobby groups to militaries using social media, peace researchers and concerned citizens must hone their digital literacy skills.